Project consisted of 4 miles of 4-land highway, one mile of secondary highway, 3,200 feet of concrete channel, 2 miles of storm drain, 1.5 miles of sewer and water lines, and 10 large drainage structures. Ludwig was responsible for all phases of construction staking including slopes, pavement, draiange facilities and structures, and curb. All staking activities were performed in accordance with Caltrans' Staking Manual. Work was done for County of San Bernardino Transportation and Flood Control. 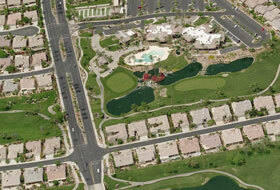 Ludwig Engineering has designed more than 500 land development projects throughout California and Arizona. A typical land development project incorporates most phases of civil engineering including land planning, surveying and mapping, design of grading, streets, water and sewer systems, street light, drainage facilities. Ludwig has performed the construction staking of most of these project. Provide construction staking services including slope staking for approximately 2,200 L.F. of earthen levee, canal lining, access road and rip-rap for Pulte Homes. Provided all phases of construction staking for the entire regional park site including lakes, roads, and drainage structures. We currently provide settlement checks for the dams for each of the three lakes twice a year for San Bernardino Valley Municipal Water District.